At 10 a.m. on a cold morning in April at Whittier Medical Center, Sophia was born. She was a healthy baby girl at 7 pounds and 1 ounce, with a future in America to look forward to, if she chose it. Her mother, Tracy, came from Shanghai to give her this choice — a chance at the world’s best education, a safe childhood and reliable medical care without long lines. “I’m here to give my kids better options,” said Tracy, who asked to be referred to by her first name because she has read stories about U.S. officials cracking down on mothers who come to America to give birth. In 2015, the State Department issued 2.27 million visas to Chinese tourists. It does not track what proportion of visas are issued to birth tourists. Childbirth is a legitimate reason to travel to the U.S., and as long as Chinese nationals provide the correct paperwork and evidence they can pay for their medical care, they will be issued a visa, department officials said. SAIPAN, Northern Mariana Islands—This U.S. territory in the western Pacific is known for its epic World War II battle, white-sand beaches and the enduring culture of its indigenous Chamorro people. But for a certain class of Chinese parents, Saipan has become known as the latest hot spot for birth tourism, a place where women can give birth to babies who will automatically acquire U.S. citizenship. 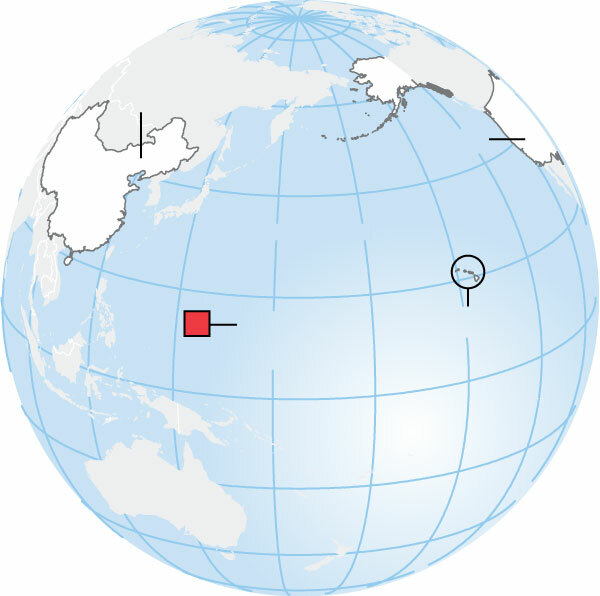 The Northern Marianas, an island chain that includes Saipan, is the only U.S. soil that Chinese can visit without a visa, after a change in immigration policy in 2009 allowed Chinese and Russian tourists visa-free entry for up to 45 days. “It’s just like if God opened a window for you,” said a Chinese father who works as a translator here after coming a few years ago to ensure his child would be born American. The Northern Marianas pressed for the visa waiver to support an economy reliant on tourism, notably to Saipan’s casinos and gambling parlors. The number of American babies born here to Chinese women who entered as tourists also climbed—to 472 last year from eight in 2009—according to the Northern Marianas government. Last year, for the first time, more Chinese tourists gave birth here than Americans. Lured by the charm of little Havana or the glamour of South Beach, some 15 million tourists visit Miami every year. But for a growing number of Russian women, the draw isn’t sunny beaches or pulsing nightclubs. It’s U.S. citizenship for their newborn children. In Moscow, it’s a status symbol to have a Miami-born baby, and social media is full of Russian women boasting of their little americantsy. A day after the Trump administration launched the largest immigration raids in nearly a decade, federal agents stormed 20 “birth hotels” in California. In the unprecedented federal sting operation, the feds raided locations in Los Angeles, Orange and San Bernardino counties. They were looking for the masterminds of the operations, who make hundreds of thousands of dollars a year off the scam. “It’s not necessarily illegal to come here to have the baby, but if you lie about your reasons for coming here, that’s visa fraud,” Claude Arnold, special agent in charge of Homeland Security Investigations for Los Angeles, told NBC. Chinese nationals use the so-called birth hotels in order to win citizenship for their children — in most situations, a child born in the United States or one of its territories will automatically receive American citizenship. Women often pay as much as $100,000 to get into one of the hotels. The women get discounted rates at hospitals to deliver their babies. “More than 400 babies linked to the scheme were born at just one facility in a two-year period, investigators said,” NBC reported. That costs the hospitals millions — costs borne by Americans in the form of higher charges. In the early morning raids, ICE agents hit more than 100 stores across the country, arresting 21 people. The raids were the largest since President Trump took office and expanded on the increased enforcement of existing laws. There has already been a 40% increase in deportation arrests since January 2016. These stories are just the tip of the iceberg, so it’s easy to see why it’s urgent we address the 14th amendment. We are being used by thousands of foreigners for purposes of citizenship. These people have no intention of being loyal to our country and our sovereignty. – we’re merely a convenience to them. When all these children turn 21 they can sponsor their parents’ application for an American green card, thereby flooding us with more immigrants who may assimilate, or they may not. It’s not just the Chinese and the Russians who are taking advantage of us – remember too all those refugees from the Middle East that Obama was bringing in by the boatloads. Trump has done what he could to slow down that traffic, but it’s too late for the ones who are already here. Guess there are cons about being the best and wealthiest country in the world. We’ve got to get hold of the 14th Amendment! There are definitely cons to being the best – everyone wants a piece of you. You’re right about the 14th, but there’s a pattern in the US and a big part of the reason things like the 14th never gets fixed. An issue like this comes up, we talk about it and get ourselves all ginned up over fixing the problem, then a few days or weeks later, another topic takes over the headlines and we move on to it, while leaving the first topic unresolved. Look at gun control – we never settled it and we never clarified the Second amendment. The same thing happened with Obamacare – it was terrible and they threw some changes at it, but they never got rid of it.They moved on to the next hot item. We never finish anything – we just move on the next topic and the next election. Excellent work putting the big picture together, Kathy. I once had a co-worker from India who told me that her plan was to bring her mother here once her citizenship was finalized. That way her mother could get on Medicare and other U.S. benefits. She saw nothing wrong with this at all. America is being sold off, piece by piece, and all the usual suspects are enabling it. Years from now, when the system is broke and the pain is here, they’ll scream at the “mean” Republicans for not rescuing them from their own corruption and stupidity. Thank you, CW. I was hoping to find more information of the number of these women coming here, but most of the lefty sites approach it from the personal standpoint by telling the women’s stories – ‘they’re just coming here for a better life, so why would we object to that?’ Well, for starters, because the US can’t hold nor support that many deadbeats. There’s a ton of stories out there just like your co-worker’s, who see nothing wrong with gaming the system, so I think Trump is right to address this and he needs to work on our visa system next. I saw another post today about the caravans – up to four of them now – and the last sentence sums it up well.